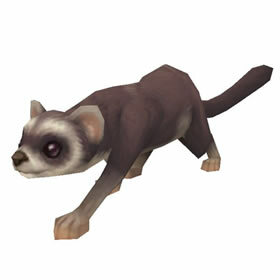 To unlock the quest that rewards this pet, players must first complete the 'Unlikely Allies' storyline. Refer to Secrets in the Sands for all main storylines in Vol'dun. Do the quests when you follow the Nazmir questline (Horde) and once you unlock the first Vulpine settlement, there is a quest right outside it that awards this little fluff. Also: Polecats are carnivores, not rodents. Infinitely useful because of his Uncanny Luck ability WITH Feign Death. Use him with pets with low% to hit abilities like Demolish for great effect! Poda was just a small part of the larger business, always trying to live up to the standards of his older brother Coda.